A set of bioluminescence genes has been transferred from one eukaryote, a glowing fungus called Neonothopanus nambi, to another eukaryote, a non-glowing fungus called Pichia pastoris. This relay race is no mere sport, and it concerns organisms other than yeast. Higher organisms including plants and animals are more likely to accept a bioluminescence pathway from another eukaryote than one from a bacterium. Moreover, if higher organisms are set aglow by genetic manipulation, they could push diverse biomedical and bioengineering applications across the finish line, including the much-discussed idea of replacing streetlights with glowing plants. The eukaryote-friendly bioluminescence genes were identified and passed from glowing to non-glowing yeasts by an international team of scientists led by Ilia V. Yampolsky, a researcher at the Institute of Bioorganic Chemistry of the Russian Academy of Sciences in Moscow. 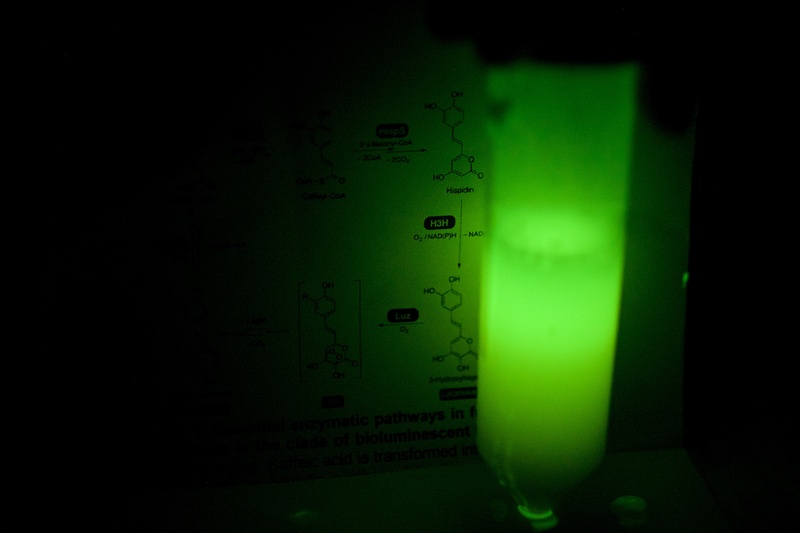 Using library screening and genome analysis, the team identified the enzymes that contribute to the synthesis of luciferin. The scientists showed that fungal luciferin, the substrate for the bioluminescence reaction, is only two enzymatic steps away from a well-known metabolite, called caffeic acid, which the fungus generates. Additional findings appeared November 26 in the Proceedings of the National Academy of Sciences, in an article titled, “Genetically encodable bioluminescent system from fungi.” The article emphasized that the expression of genes from the fungal bioluminescent pathway is not toxic to eukaryotic cells, and the luciferase can be easily co-opted to bioimaging applications. 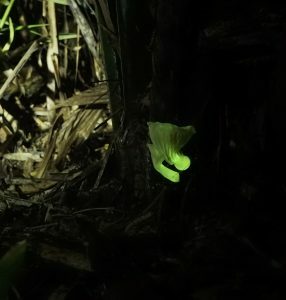 Comparing mushrooms that glow with those that don’t, co-author Fyodor Kondrashov, Ph.D., professor at the Institute of Science and Technology Austria (IST Austria) and colleagues also uncovered how gene duplication allowed bioluminescence to evolve more than a hundred million years ago. Why it evolved is still unclear. Knowing how bioluminescent fungi glow, the researchers then lit up non-bioluminescent eukaryotes. Inserting the gene encoding luciferase in Neonothopanus nambi along with three other genes whose products form the chain that converts the metabolite caffeic acid into the substrate for the reaction, luciferin, into the yeast Pichia pastoris resulted in glowing colonies of yeasts. “We don’t supply a chemical that makes the yeast glow. Instead, we supply the enzymes it needs to convert a metabolic product that is already present in the yeast into light,” explained Dr. Kondrashov.